HEATED FLOORS – Senergy Mechanical Inc.
For optimal comfort and conservation of energy and money we recommend you consider heated floors. As an option becoming more and more popular in recent years, it really is no wonder why. For one, heated floors provide more efficient heating than traditional home heating methods such as furnaces or radiators. Heated floors work by heating the room from the ground up. The system works by laying a series of pipes underneath the floor, whatever the surface may be. Heated floors work under surfaces such as wood, concrete, tile, carpet and others, making them very design flexible. The pipes carry hot water beneath the floor and convey the heat to the room. Since the heat comes from the floor that is where the concentration of warmth is. This is the ideal option because that is where people will be. For rooms with high ceilings it takes more energy and heat from the furnace to provide warmth. With heated floors no energy is wasted heating unused space. Another benefit is that heated floors provide the utmost comfort while keeping the air clean. Furnaces blow air all throughout the house from all the dusty air vents and circulate it around you. 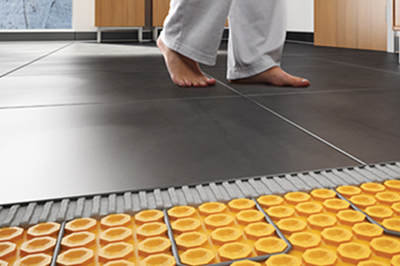 Heated floors do not start any air flow, preventing any circulation of dust or air pollutants. For this reason heated floors are the optimal choice for people with allergies. Unlike most furnace heated homes, heated flooring has the option to control the temperature in each room. While normally you would be blasting the heat in the entire house just to get the temperature right for one room, you can adjust just that room with heated floors. Commonly used rooms like the family room, kitchen and bedrooms can be turned up, while energy can be saved on rooms like the dining room. Additionally drafty areas such as entrance ways and basements can be set to a higher heat setting without making the rest of the house too hot. In this way heated floors provide not only comfortable temperatures but also comfortable use. By giving you the control of individual heat settings for every room, you can save more money on your energy bills. This economical option is also virtually unnoticeable. Quite often furnaces can be disruptively loud and annoying. Heated floors use flowing water, which is silent, allowing you to go about your day undisturbed. This innovative technology is guaranteed to provide your home with comfort you will love. If you are interested in heated floors you can reach us at (647)289-9247 for more information and details. Do not hesitate to call us today for a better, quality heating option.